I just committed straight plagiarism there, taking that line directly from Blue Star Nutraceuticals’ webpage for Elevate, the topic of this review. However, I included it to give Blue Star props: That’s damn good marketing. And now I’m conflicted: It reads like a challenge, like it doubts I will or (worse) can read past the headline into the bulk of the site’s copy. Yet, the word “ironically” throws me off: What the hell is ironic about that? Would it thus be doubly ironic then if I DIDN’T read past the headline? Am I thinking too much about this? Blue Star is using mind games against the Geek. Mind games that I quite enjoy, and I despise them for that. Likewise, I feel like I’m being tricked into writing this review by Elevate’s sleek design, but WHATEVER. Let’s get on with it. Who Takes Blue Star Nutraceuticals Elevate? Conclusion: Does Blue Star Nutraceuticals Elevate Work? Manufactured by Blue Star Nutraceuticals, Elevate is an energy-driven nootropic formula (although the energy is of the non-nootropic variety). GTE and PEA take up the two largest dosages, a questionable feature considering that the former can be found cheaply in other products and the latter is an ineffective supplement. The remaining ingredients accomplish a diverse range of cognitive-enhancing bio-effects, topped by Blue Star’s patented SD Delivery Technology Complex. Directions: For enhanced mental performance take 2 capsules of ELEVATE 30 minutes before desired results with 8 ounces of water. Do not take within 5 hours of sleep. Do not exceed 4 capsules in a 24-hour period. Green Tea Extract (98% polyphenols, 50% EGCG) – Green tea extract (or GTE, if you’re a true dogg homie) is a reliable source of antioxidants, most often taken for their fat-burning potential. The nootropic portion of GTE (L-Theanine) can be found a few entries below. Beta-Phenylethylamine – Phenylethylamine (or PEA, if you’re a cool cat) operates as an important neurotransmitter, influencing feel-good chemicals such as serotonin and dopamine. However, PEA supplements are questionable as oral consumption seems to deactivate the compound into inactive constituents. Ginkgo Biloba (24% glycosides, 6% lactones) – Often recommended to older folk for its circulatory benefits, Ginkgo has also demonstrated significant improvement on short-term memory and recall. More on Ginkgo Biloba. When the green tea focus hits. 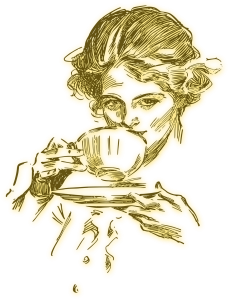 L-Theanine – Of the green tea compounds, L-Theanine is most important to cognition for its promotion of alpha brain waves, which have been associated with feelings of relaxation and focus. More on L-Theanine. Rhodiola Rosea (3% rosavins) – Sometimes I take Rhodiola before writing, sometimes I take Rhodiola before working out. Its anti-fatigue, anti-stress benefits seem to be universal, regardless of the task laid before you. More on Rhodiola. Phosphatidylserine (20%) – Due to its direct role in cell membrane structure, PS makes for an effective, reliable cognitive enhancer, increasing cell-to-cell connectivity and release of neuronal toxic wastes. More on Phosphatidylserine. Hordenine – More stimulant and fat burner than nootropic, hordenine may enhance mood and energy, but it’s hard to tell until I see more research. As such, this is a technically risky compound here. Alpha-Glycerylphosphorylcholine – While I prefer Citicoline as my nootropic choline source, Alpha-GPC actually supplies more choline per serving. Choline is a precursor compound to neurotransmitter acetylcholine and cell membrane constituent phosphatidylcholine. More on Choline Donors. Huperzine A – This potent compound can accomplish significant improvements on acetylcholine levels in tiny doses. Except instead of providing choline, Hup-A inhibits acetylcholinesterase, an enzyme that catalyzes acetylcholine breakdown. More on Huperzine A. The main ingredient of interest here is Black Pepper (supplied as BioPerine, a popular piperine extract). Adding BioPerine to a formula is always a smart move for manufacturers, as the extract is able to significant enhance nutrient absorption in very small dosages. As far as I know only Blue Star Nutraceuticals supplies the XD Delivery Technology Complex. Generally, it seems like a good idea, yet I’m unsure of how most of the ingredients help (outside of Black Pepper and AstraGin). Could be a potential waste of precious capsule space. The Blue Star website for Elevate is slick, helpful, aaand kind of annoying in that GQ-ish I-know-what-I’m-talking-about-because-I-can-afford-lavish-clothing sort of way (“so listen up, PEASANTS”). I admit that I’m occasionally swayed by shiny supplements, but dammit I’m on my A-game today, so let’s get to the point here: Are the nootropics good?? Blue Star Elevate’s formula could be better. For one: Blue Star could give Alpha-GPC more loving. 50 mg isn’t going to cut it for this awesome choline donor, which would otherwise synergize nicely with Hup-A’s inhibition of acetylcholinesterase. For two: Blue Star could reconsider GTE, PEA, and Hordenine, namely the latter two. GTE is at least brain healthy, but still clogging up space better spent on, say, Alpha-GPC, whereas PEA doesn’t do much as a supplement and Hordenine is more of a stimulant fat-burner. Other than that I have no gripes with this cool-guy stack. Blue Star provides a diverse roster of ingredients, covering a spectrum of brain benefits (and some bodily benefits as well). The herbs are delivered in potent extract standards and not plain raw powder. $1.27 per serving is not too shabby for the quality of this stack. GTE as the leading ingredient isn’t the best option for a nootropic stack (Alpha-GPC would’ve worked much better). Elevate could get rid of PEA + Hordenine, namely PEA to clear up 250 mg of space for a different ingredient that actually works. Hordenine may get in the way of double-dosing the servings, particularly for users who are sensitive to stimulants. Lucky for us, Blue Star Nutraceuticals explicitly states the intended audience of their formula, listing off the following fields of “competition”: Gamers, Athletes, Businessmen, Tradesmen, Students, and Musicians. 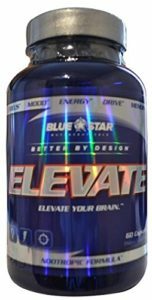 You can buy Elevate directly through Blue Star Nutraceuticals as well as a number of various retailers, including Amazon. Elevate likely works, but not to any crazy, amped-up effects. It’s a smart supplement for long-term consumption, supplying brain healthy antioxidants, phosphatidylserine, and choline (albeit under-dosed choline). The hordenine may give you a stimulated edge, although there isn’t much research to back this compound as a cognitive enhancer. However, there are quite a few positive customer reviews backing this product, many of which report no toleration build-up or nasty side effects. Given the cheap price, I’d say there’s low risk in at least trying Blue Star Nutraceuticals Elevate. But there’s also no risk in not trying Blue Star Nutraceuticals Elevate, so what the hell am I saying?? You got to pay to play, baby!